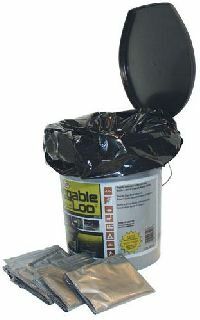 The Luggable Loo is the most economically priced portable toilet by Reliance Products. The simple bucket style design and traditional snap-on lid makes this one of our top sellers. The Lug gable Loo is an extremely rugged portable toilet for any outdoor adventure. The Luggable Loo Portable Toilet The Luggable Loo is the most economically priced portable toilet by Reliance Products. The simple bucket style design and traditional snap-on lid makes this one of our top sellers. The Lug gable Loo is an extremely rugged portable toilet for any outdoor adventure.